I find that all great science fiction is both a celebration and a warning. It fires our imaginations, draws us in with fantastical ideas, and leaves us with lingering questions. After all, science fiction isn’t about the future. It’s about the society in which it was made. My work is created primarily as a means of expressing my exasperation with industrialization, gentrification, and growing class divisions. To depict this, I look towards the future. I've found a place that is beautiful, but unwelcoming. One that, despite it’s grandeur, is not a place you would want to live. A place which, while removed, echoes the world we live in today. 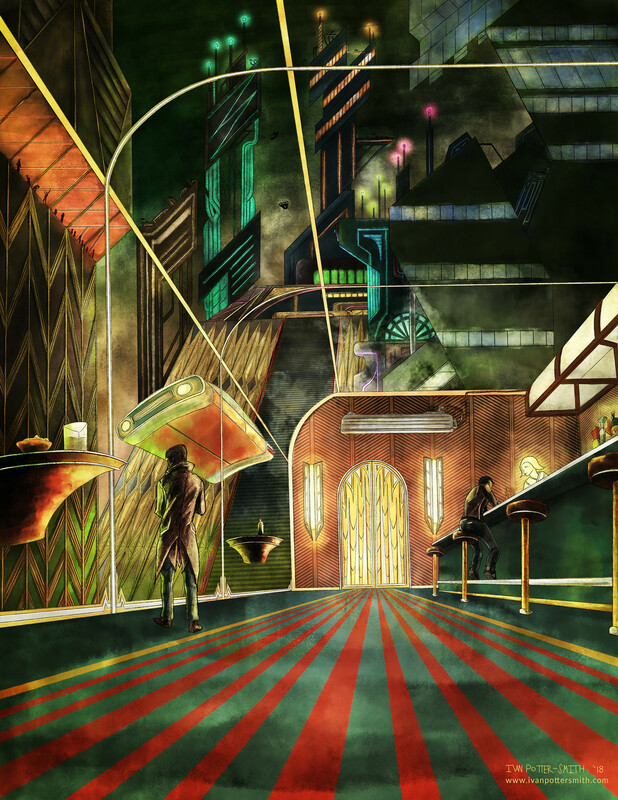 Stylistically I seek to blend the aesthetics of Art Deco and Cyberpunk. I find the inherent duality in each to be both beautiful and fitting for the subject matter. Art Deco is an effortless blend of the organic and industrial; living and mechanical; natural and manmade. Cyberpunk, in the words of William Gibson, is “high tech meets low life.” Both aesthetics serve to visually represent the positive and negative aspects inherent to the current paths of technological and societal advancement. The issues we face today are not so different than the ones we have wrestled with many times before. I hope that highlighting them within an abstracted environment will afford the viewer an avenue for introspection; to consider their lives today, and how their actions might perpetuate this cycle. Perhaps we can break the cycle, and step into a world everyone wants to be a part of. • View Final Artwork Before it Goes Public!